from completed build Addo's Gamer! First time gaming build. The first thing I noticed when I got this case is, man, is it small. Now it isn't the smallest case but when I was looking at it on youtube I thought it would be fairly small but it is really compact. It is made of steel with some plastic on the front and includes 1 120mm intake fan and 1 80mm intake fan. There was also little to no flex when I tried stressing the case with my hands, so +1 to CM. I removed the smaller fan since it got in the way of some cables. Once I took the smaller fan out though building in it was fairly easy. My biggest gripe with this case though is that the dust filters are pretty bad. Non-existent on the sides with one in front and one on top. The one on front isn't too bad but the one on the top covering the PSU fan is terrible. The wholes are just too bug. Also, fitting my second HDD into here was a pain since, due to it being a small case, there was very little room for me to move about since I had wires all over the side where I needed to mount it. However, that is excusable due to the small nature of this case. Stylish and Compact. Relatively easy cable-management. 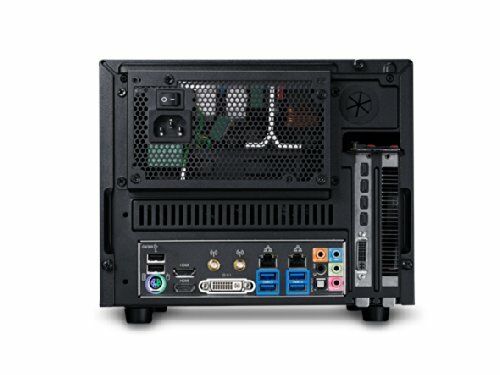 Reasonably roomy Mini-ITX case that doesn't break the bank. Very simple design (just one big chamber) so good cable management is quite important with these, especially if air-cooling. Luckily there are lots of tie down points along the bottom and sides of the case, so if you plan your cable routing well you'll be left with a relatively unobstructed airflow path from front fan intake straight back to the motherboard in the rear. Good value case for a guaranteed fun build! I can't comment on other cases of this size, and I've seen others done well but I found the cable management really difficult. This is my first build so I'm sure that's a factor. I love small cases. Which is why the Elite 130 still seems a bit big to me. Though it makes use of it's length by making it easy to slap on a 120mm radiator. There's a lack of top vents (other than the one for the PSU) which I feel traps the heat, making it a bit hot to the touch after a couple of hours on heavy load. 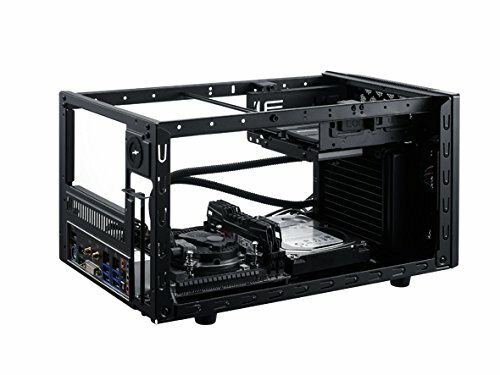 If anyone is looking for a gaming mini-ITX case, please consider this. It may not look fancy, but one may be surprised by how much can be crammed into it. Any modern graphics card can fit inside (my R9 290 is about 11.5 inches in length but there's a good inch or so before the USB3/audio cables start interfering), as can any AIO liquid cooling system (ex: Corsair H80i). However, be careful about where you're routing cables, as it's extremely difficult to plug most things in once a power supply enters the equation. Either buy a nonmodular power supply with the bare minimum or buy a modular power supply with the option of a 'short cable' set. I believe I made a great choice in choosing the elite 130 case as it made everything a breeze to work with. very customize-able, and there's a lot of room, tons of drive space,and the gtx 970 fit perfectly. Just make sure to think about the order of how you are installing the parts. 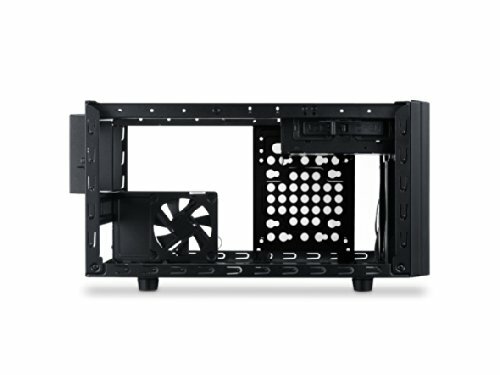 While this case is small, there is still plenty of room for additional drives, should I choose to expand. The front half of the case is mostly empty, providing sufficient airflow for cooling. The case comes with a front 120mm fan and a side 80mm fan - unfortunately both are 3-wire so no PWM (no variable speed control). Since I'm going with the Seidon 120M water cooler, I will not be needing either fan and they will be removed. (The Seidon comes with it's own 120mm fan.) The PSU sticks out the back of the case by ~1 inch which leaves more room inside. 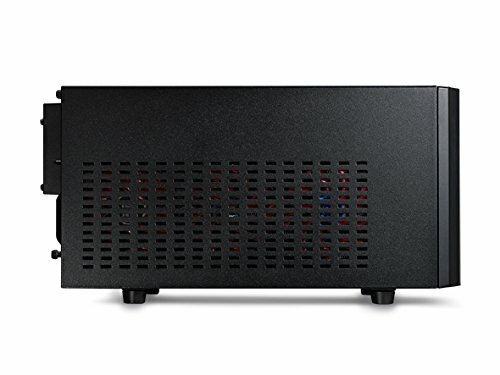 If you are looking for a Mini-ITX that doesn't break the bank and has a 5.25 slot then this is probably the case for you... now do you live in a very dusty environment? Then this case is not for you. Too many air openings which is great but none of them are protected which means a lot of dust. But as long as you keep it clean here and there you should be fine. The USB 3.0 cable for the front IO is extremely stiff so keep that in mind and they could have added in a little more cable management little openings to put zip ties and what not. The feet are plasticky as well which means fi you have this in a polished place it will slide around. Overall though an okay case for the price. Good case, easy to work in, side panels stupid to put on.